PMC : Synefra Infrastructures Ltd.
GE had planned to set up a manufacturing facility at Chakan, Pune, to manufacture a host of different products ranging from aviation to turbo machinery components to measurement and controls and wind turbines. Challenge: 24m tall building, working at that height was risk. Three Months before the actual start of site activities, the Tata BlueScope Building Solutions Team identified critical safety requirements of the project and prepared a ' Safe Work Method Statement' for each activity as well as a Construction EHS plan. a. Lifting holes were provided in the primary members from POD lifting. b. Additional holes and brackets were provided in the refers for fixing of life line posts around building's periphery. c. Standard life line posts designed by Tata BlueScope Building Solutions were certified by a third party and a lifeline of steel wire rope was proposed. Daily inspection check lists were displayed on each equipment and a third party inspection of the equipment on site was also conducted. Due to safety reason, use of hydra for material loading and unloading was not allowed. A detailed site plan for safe storage of materials and equipment movement in the yard was prepared. Safety risks were involved in loading, unloading and stacking of structural steel therefore material sticking with the height indicators was proposed. To constantly remind and highlight the importance of safety to workmen displays of safety cross, safety statistics, safety gallery were placed on the site. EHS training's for staff, working at height training, safe lifting practices and fire fighting techniques for workmen, EHS recognition programs, EHS promotional activities, motivation programs were conducted as per monthly EHS calendar. (i) Working in boom lift for all work at height. (ii) Mandatory use of full body harness with double lanyard. (iii) Sky- Web I Fall protection system was suggested to ensure safety during roof liner panel installation. 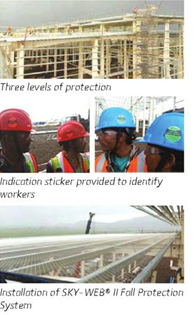 For worker identification, induction stickers were provided- red colour helmets with sticker was for worker working at height, and green colour helmets sticker were given to those working at ground level. To avoid fall of tools from height, all tools were tied while working at height. The roof access staircase of British scaffolding type for roof access and an access control system was implemented during roof installation. Edge protection was provided at roof edge. The erection of components such as brace rods, girts, flange braces, pipe struts, sag angles, SKY- WEB II, crane platform, flashing's were fixed using boom lifts and cranes. One Activity- One Supervisor principles was followed. A 36 m long POD containing 4 rafters was firmly fixed by purlins and was lifted at one time, this reduce the risk of working at height since most of the erection activity was done on ground level. (iii) Canopy with roof sheeting was installed on ground and was fixed in position with the help of cranes and boom lifts. (iv) Strut pipe erection by using cranes and two boom lifts. (v) Painting touch up at ground level and at height with help of boom lifts only. 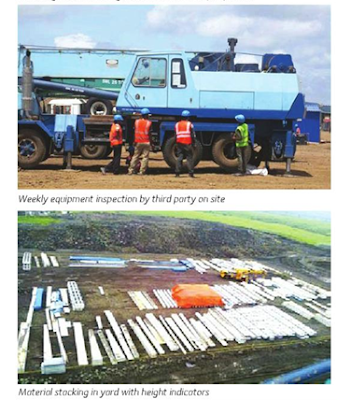 -Tata BlueScope Steels zero tolerance approach to safety violations resulted in completion of the GE project safely.